Welcome to our 5th Annual Mardi Bras! Mardi Bras is our largest fundraiser of the year - bringing in the funds to support over half of our annual budget! 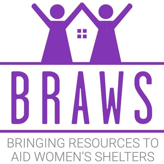 Money raised from this year's Mardi Bras will be used to purchase menstrual supplies and undergarments for shelters and schools in our community in 2019! Mardi Bras will be held on Friday, February 22 at Westwood Country Club in Vienna, VA from 8-11 pm. Online sales have closed. Tickets can still be purchased at the door for $125 which includes hors d’oeuvres, 2 drinks, raffles, silent auction, music, valet, special guests & more! Donations of new w/ tags bras & underwear as well as unopened packages of tampons & pads are greatly appreciated. Want more info? Click HERE for FAQ’s. Our Raffle and Silent Auction Lists are coming soon- Raffle packages will all be worth over $300! WE HAVE A VARIETY OF SPONSORSHIPS AVAILABLE- AND THEY ALL INCLUDE EXCLUSIVE VIP EARLY ENTRANCE TO THE EVENT ! View details BELOW! Signage at the Event with only Spotlight Sponsor’s logos. Name recognition on all BRAWS social media posts/website content which includes photos taken during the event by images for Good.